Quick Programming Note: I have included all of the This Day in Angels Baseball features from the 1st of July through today, July 8th. Our AngelsWin.com Summer fanfest was last week so I was unable to post these until today. We're back on schedule however so look for these daily, along with our daily minor league reports starting next Monday. Tomorrow look for our weekly prospect hotlist on the Blog. If you missed our mid-season prospect grades last week, check it out here. July 8, 1990 at County Stadium in Milwaukee, the California Angels lost to the Milwaukee Brewers 20-7. The Angels would stake starting pitcher Bert Blyleven to a 7-0 lead, getting home runs from Brian Downing and Bill Schroeder, going into the bottom of the 3rd inning. The wheels would then fall off for the Angels as Blyleven could not get out of the 4th inning and the game was now tied at 7-7. The Angels would then need four more pitchers in the bottom of the 5th inning as the Brewers scored 13 runs on 10 hits with 6 walks in the inning. The Angels would use a total of 7 pitchers in the game before it was finally over. The 20 runs is an Angel club record for runs given up on the road and the 10 hits given up is their record for an inning, while the 13 runs in the inning ties a club record. The Angels would finish the season at 80-82, 4th in the American League West that year. Reichardt in the game and a three run home run from Don Mincher in the bottom of the 6th to put them ahead for good. Mincher came to the Angels at the end of 1966 in the trade that sent Dean Chance to the Minnesota Twins. Mincher hit 25 home runs and drove in 76 in 1967, making his first All-Star game appearance while playing for the Angels. straight wins on their way to a 19-7 month of July. The Angels would finish the season at 54-29 from the start of July but would fall short as they finished 4 games back of the A's for second in the American League West, missing the playoffs. The end of 2006 was exciting for fans as besides trying to make the playoffs they were rooting on Tim Salmon, in his 14th season with the Angels, to hit his 300th home run. Salmon would finish his career as an Angel and fall 1 short with 299 home runs. Angels, being selected to the All-Star game in 1995 and was voted the teams MVP in 1998. July 4, 1979 at Anaheim Stadium the California Angels beat the Oakland Athletics 7-4. Mark Clear picked up his 9th win of the season as the Angels would score 10 runs in the bottom of the 8th inning. 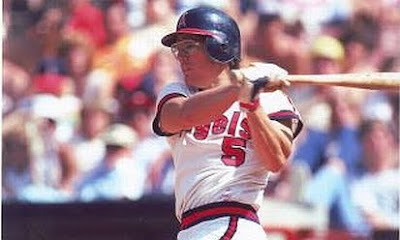 Carney Lansford went 4-5 with 4 runs scored and 2 RBI; Don Baylor was 2-3 with 2 runs scored, 5 RBI and a home run; Brian Downing was 3-4 with 2 runs scored and Jim Anderson who was splitting time at shortstop with Bert Campaneris went 2-3 with 2 runs scored and 3 RBI. The 17 runs scored by the Angels are the most on a fourth of July in their history and during July of 1979 they would win the most games in a month that year on their way to their first ever American League West title. July 3, 1970 at Anaheim Stadium the California Angels beat the Oakland Athletics 4-0. Ken McMullen hit a three-run home run in the bottom of the 4th inning to lead the Angels scoring. Clyde Wright pitched the second no-hitter in Angels history in the game and first ever at Anaheim Stadium. Wright was selected by the Angels in the 6th round of the 1965 free-agent draft and would make his major league debut on June 15, 1966. Wright played 8 seasons with the Angels compiling an 87-85 record with a 3.29 ERA. 1970 would be Wright's best year going 22-12 (First Angel player to 22 wins, later tied by Nolan Ryan and only left-hander to win 20 games) with a 2.83 ERA. Wright earned the American League Comeback Player of the Year Award in 1970 after going 1-8 the previous year and make his only All-Star game appearance that year. Wright was later traded to the Milwaukee Brewers in October of 1973. July 2, 2009 the Los Angeles Angels of Anaheim beat the Baltimore Orioles 5-2 at Angel Stadium. John Lackey pitched 8 innings, allowing 2 runs on 4 hits, striking out 7. Brian Fuentes picked up his 23rd save to date, on his way to 48 on the year (2nd all time in a single season for an Angel). Bobby Abreu would go 2-4 in the game with 4 RBI and 2 home runs. After signing a $5 million one-year contract at the beginning of 2009 this game would be a turning point for Abreu as he went on to hit .380 with 28 RBI in July, earning American League Player of the Month. Abreu finished 2009 with 96 runs; 30 steals; 15 home runs; 103 RBI and a .293 average. The Angels would sign Abreu to a two year deal at the end of the 2009 season, with a club option for 2012. July 1, 1994 at Camden Yards in Baltimore the California Angels lost to the Baltimore Orioles 14-7. Joe Magrane would only last 2 1/3 innings, giving up 7 runs on 6 hits, for his 5th loss. Both teams would combine for 21 runs on 25 hits with 11 home runs in the game (Angels club record for home runs by both teams in a single game). Baltimore hit 6 home runs in the game while the Angels got homers from Chad Curtis, Jim Edmonds, Chili Davis and 2 from Tim Salmon. The Angels never got things going that year, finishing 2 months with an under .400 winning percentage and last in the American League West at 47-68 before the players strike ended the season.